We have a motto in Chicago: if you don't like the weather, wait a minute and it will change! One week ago on Sunday it was raining and 45 and today it's predicted to be sunny, humid, and 95. With the warmer temperatures this week, I got up early for my runs and enjoyed some beautiful sunrises. It's been a long time since I ran with the sunrise and it was just what this melancholy miler needed! All my runs were easy paced with run/walk intervals. I didn't run on Saturday (see below) but on Sunday I got up early and out the door for 6 hot, steamy miles. It was already 75F with 98 percent humidity, so the run/walk intervals were in full force. You know what? I was soaked when I was done but this was the best run I've had all week. Maybe, just maybe I'm getting out of my slump. Fingers crossed. It was a big, hard sun at 6:30 am! After 2 weeks off, it felt great to be back at the box! Coach Sammy Jo had me do back squats alternating with hopping over the bench and the trifecta of 100m on the Skierg, prowler push, and 50# over the shoulder ball thingies. It was hard and it was fun and I was more than a little sore the next day! Because my knee is still tender, I can't do anything that involves kneeling. Hopefully, I'll be able to resume yoga next week. I wonder if Erin misses me? It was a busy weekend! Between prom and graduation, I was running--not literally, but you know what I mean. After work on Friday, I drove my tuxedoed son to meet his girlfriend and took a few pictures of them before they left to meet with other kids for the group pictures. Slacker mom that I am, I skipped that portion of the evening. The high school broadcast a live "red carpet" feed complete with interviews and I watched that instead, catching a quick glimpse of my son and his date scurrying past the camera. I was thoroughly entertained by the kids who did stop to be interviewed. You gotta love teenagers! Instead of going for a run on Saturday, I got up early and went to Home Depot with my husband. It was already steamy at 6 am. While he shopped, I picked out flowers and plants. We worked in the backyard all morning, pulling weeds and planting. It was a lot of work and I sweated as much as if I ran. Why do weeds seem to grow so much better than the stuff I plant? I filled up 2 large lawn bags with all the weeds I pulled. Cocoa and I were dog tired after our morning in the backyard. Sunday was graduation. I wrote this post prior to the ceremony, so I'll share more details on Friday's Coffee Talk post. It's been an emotional weekend so far, but it's been filled with family and love. Moving on is always bittersweet. I hope you are enjoying this long holiday weekend. Tell me about your week? Are you celebrating Memorial Day with family and friends? Did it warm up by you? What are you looking forward to this summer? 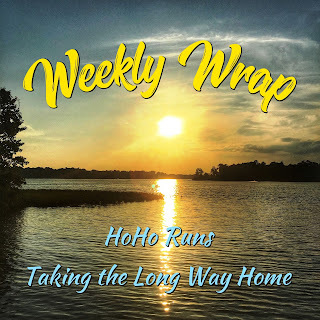 Welcome to the Weekly Wrap, hosted by Holly and me. We're happy to have you here! New to the linkup? Check out the rules above. Please don't drop a link and leave without commenting on the hosts' blogs as well as at least 3 others. This link up is for fitness bloggers only. 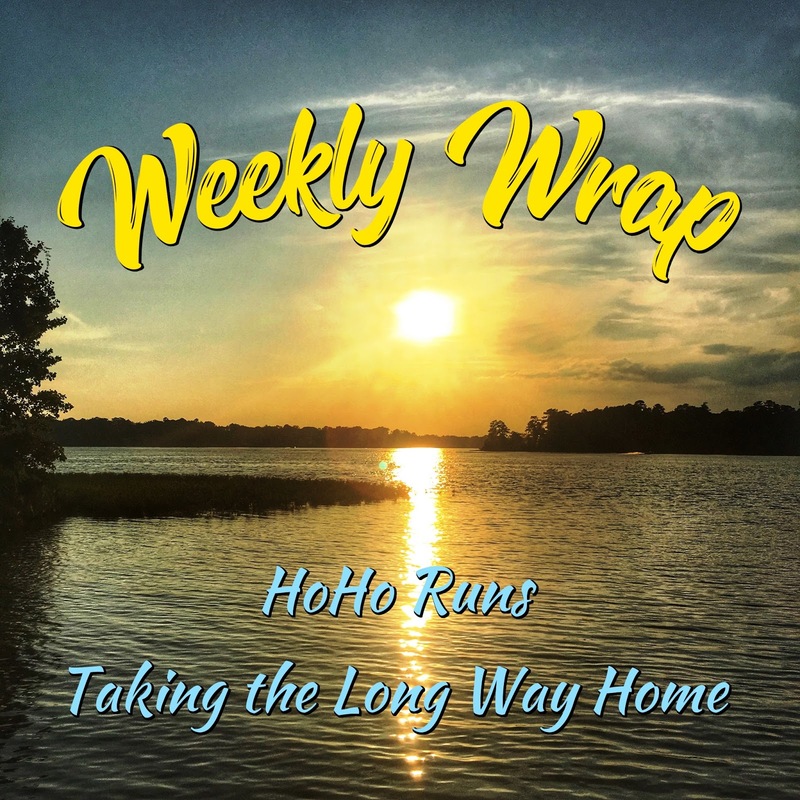 Thanks so much for supporting the Weekly Wrap! I'm glad you ended the week with a strong-feeling run. I'm so glad I had that good run! I'm hoping that I'm finally on the road to recovery (see what I did there?) after the bike crash! Oooh, you had a great workout getting back into the box. And I'm so glad you had a good run! I'm surprised prom and graduation were the same weekend. It doesn't usually happen that way! Especially leading up to a holiday weekend! Did something get rained out/rescheduled? And I feel you on the weeds. UGH. The schools by us do prom and graduation on the same weekend. I think the idea is to make sure the kids behave at prom so they can walk at graduation. I have been slacking on yard work. I figure I'll need something to do once this marathon is over. What an awesome idea to broadcast the prom's red carpet. I bet that was quite the entertainment! What a great looking couple too. I'm glad to hear you ended the week on a "high" running note. You and me both! I was starting to get all discouraged again when most likely my slump was due to the antibiotics and recovery from the crash. It DID warm up here. I did a fatass run with 25 friends today. I did 15 miles of humid, muddy hills around a lake, the grilled out and socialized. It was perfect! That sounds like fun! LOL the name of that run! Prom AND graduation? That's a lot! So many emotions, I'm sure. I didn't date in HS. I never went to the prom. I guess my mom was spared. I'm not sure my sister or brother did, either, we were all late bloomers in that department. It warmed up here -- until temps plummeted overnight last night. But I will be with my parents tomorrow. It will make them happy, and hey, my dad is a vet. I hope you warm back up again! But how nice that you can celebrate Memorial Day with your dad! Congrats on your son's graduation! He sure looks handsome in that tux! Now that it is light earlier, I need to drag myself out of bed earlier! It's light at 5:15 now! It's a heck of a lot easier to wake up earlier this time of year! I am glad you are feeling a little better about your running. Congrats on graduation! We are heading into ours this week too. Isn't just a weird feeling to have them all grown up and ready to leave? I am going to have a hard time come August. I still have my oldest son at home, but I am going to miss Matthew. He's such a great kid. I've never heard of prom being the same weekend as graduation - is the school trying to kill you, emotion-wise? Maybe that's it! It's been a tough one but I didn't shed a tear! Your son looks so handsome! I'm glad to hear your getting out of your running slump. It's finally getting warm here and I'm loving it. It's a little too warm but considering that last weekend was 45--I'll take it. I also got flowers this weekend. I don't have a garden, since the landscaping around the townhouse is rocks, but I had fun getting the flowers, pots, and soil. When we lived in an apartment, I did pots and flower boxes. I loved it! Total agreement on the rampant weeds that refuse to die (in my raised garden, none the less). As you know, I had a graduate this weekend as well...and there was all kinds of running (in my running shoes and otherwise). And, yes...hot and humid was the "norm" this past week, and it's looking like it's here for this next week as well. I think we're supposed to get storms and heavy rain midweek. Alberto is heading for the Great Lakes. Oh wow I hope you all are not roasting under the blazing sun at graduation today. My planting/weeding was done last week. Yassss! Love that they had a red carpet broadcast. Genius! Sounds like a big weekend for you! We had a family picnic today for Memorial Day but all weekend it has been rainy and humid. Hopefully I'll make it outside for some runs this week. It's been a crazy, exhausting but wonderful weekend! Glad to hear the running and crossfit-ing are feeling better! And ugh, the weeds...I confess I've sort of given up trying to pull them all. The weeds have nothing on the aspen shoots though. We don't have aspen shoots here, but we do get a lot of maple trees popping up! Sunrise runs are the best! Congrats on graduation! Your son looks great! It's getting hot here in NorCal. 97 degrees tomorrow! I had a very humid run Sunday after volunteering at parkrun and our run and talk (England Athletics sponsored initiative to boost the link between mental health and running) and as I was supporting my friend Ruth who was doing her first 13.1 distance for 18 months, we did a lot of Jeffing / run-walk, in fact all of the big I did with her (10.3 of her miles, argh, more than I meant to). I told her you among others use this strategy and it did help her. So thank you! I never heard the term "Jeffing" before but I'm going to use it! Sounds better than run/walk, doesn't it? Glad your friend found benefit in the method. Oh it comes from Jeff Galloway, the main proponent of the method here (Ruth has his book but there's all sorts of other stuff you can get). Oh gosh I missed out a bit in my comment which is that I did volunteering and run and talk on the Saturday and then ran on the Sunday - doh! It's crazy how much the weather has changed! I think alot of places got hit hard with humidity recently. I'm so glad you were able to get back to cross fit. Hopefully you will be back on your yoga mat soon! Congrats on your son graduating! Wow, prom and graduation in the same weekend! I didn’t remember that they did that. It’s been, ahem, a while since my kids graduated! Lots of emotions for me this weekend. But what a wonderful weekend of family and celebration! I'm feeling so content right now. It was graduation weekend here too... that and memorial day and a shut-down bridge meant crazy traffic! I can't imagine prom AND graduation on the same weekend though, yikes. As far as training goes, just take it day by day. I feel like that's the way to deal with life though, but even more so if you're dealing with a health issue like yours. Don't worry about tomorrow, or next week, or next month. The people who love you will love you no matter what and that's who matters. Do what brings you joy and do not worry about anything else! I love your advice! It's hard to go out and train when you really don't know what's around the corner, but I always have those run/walk intervals (or as another reader called them, Jeffies) in my pocket. It's nice to have that as a backup plan. Wow! Busy weekend! I you blog title made me smile! 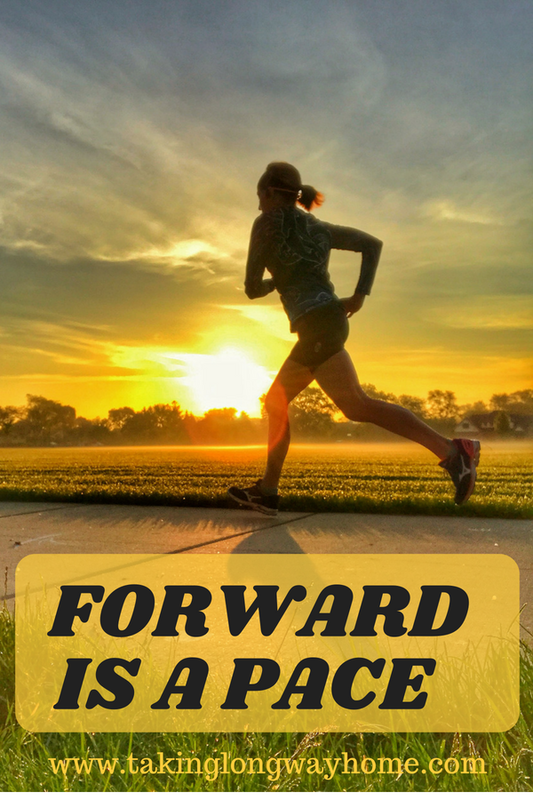 We use "forward is a pace" with our Girls on the Run team! And now I use it as my own personal motivation. Any time I am frustrated I figure if I am moving forward I am making progress even if it is small. I've never used it as a mantra until this week, but yep, Forward is a Pace is now part of my mantra arsenal! Glad your feeling better! Congrats on your son graduating, he looks so handsome in his prom picture! Keep moving forward! I’m on my way to march in a parade! I hope it wasn't too hot for your parade! It’s warming up but we did get a little cool down over the weekend. Instead of a run I’m hiking this morning! If that doesn’t feel like enough of a workout I’ll run later though. Yep, instead of running, I rode my bike today! It was too hot and humid for a run. It is wonderful to read this post, hot weather or not, hard work (weeding) or not and to see you back at it. And happy, too, to see that you areable to get back on your beloved bike a long ride. Now that the first one is over with you should be fine. I think you will always be hyper-aware and wary, but I know for sure that it won't stop you. The heat/cold see-saw has been crazy here on the East Coast as well. Saturday it hit 90+, last night I dug out my winter fleece, floor-length bath robe (My cat Mercedes was happy; that bath robe is her favorite place to sit!). Today is cold-ish, tomorrow? Predicted 86. Crazy. Still running, still at the internal level. It was great having the long weekend to keep on task. Wednesday in my last personal day before I retire (four more weeks!) so I'll be able to run during the day again. Heavenly. I hope that I will be able to run 5K without walking, but if "Jeffing" (love it!) is the only way I can run I'm okay with it. I'm taking it one run at a time. So far so good. Saturday I bought a new pair of running shoes...that should keep me from quitting! Memorial Day is quiet, just us two for a cookout at my son and daughter-in-law's and the two kids, a five minute walk from our home. What's better than that? Oh, and is it okay if I say that you son is...beautiful? Not pretty, but more than handsome. I am going to guess that eyes are mirror of the soul. He looks like a very kind young man, hence the beauty. Congratulations to him and his proud parents on graduating with highest honors. Best of luck to him as he moves on to his college years, and most of all, best of everything to your on the journey the long way home. Sending hugs and love from RI. Awww, thank you! He has beautiful eyes and yes, a very kind heart. I think he's a great kid. I'm happy for him and all that the future holds for him but I will miss him terrible when he leaves for college. Fortunately, we still have our oldest at home and hopefully he will continue moving forward too. Those are some great Crossfit photos. And you son and his date for the prom look good in that photo. Do you have tips on taking such great action photos? My coach takes the pictures--you know those CrossFit people are really into their shots. It's great because she takes so many that I have a variety to choose from! Your son and his date both look so nice! This is such an emotional time of year. Bittersweet is a great way to describe it. Have a great week, Wendy! I did ok with all of this! I feel so happy where he is it--I just hope that the transition to college goes well. Fingers crossed. Your son and date look great! Hope they had a lovely evening. Seems weird to have prom and graduation the same weekend. How fun to have the red carpet televised! I think the school has prom on graduation weekend to keep everyone behaving. I don't know for sure but that seems to be the most logical reason! I feel like I should dare complain about the heat and humidity after complaining about the cold all. winter. long. But please! We got out early for a bike ride today and it was bearable. Is there not a happy medium? I've already done all of my planting by this time each year but I haven't even started! Right? It was so cold and rainy last weekend that I really got a late start to planting. My tomato plants are off to the races with all this heat and sunshine, tho! Great workouts this week - seeing your photos from getting back to Crossfit reminded me that I need to get back to the gym myself. Your son and his date look great - I hope they had a wonderful time! I'm so happy to be back at CrossFit. I wish I could afford to go twice weekly! Love graduation and proms. We have a wedding next year. So exciting. I ran 6 miles today and then did yard work. The yard work was more tiring. Why is yard work so much harder than running? Aw. I'm glad you're back at it, but I'm sorry it's been so rough. Your son and his girlfriend look adorable! I hope they had a wonderful evening! Gotta love technology with the live red carpet stream! How cool! It's stupid hot and humid here. Add in the tropical system Alberto and it's been a soupy, soggy mess. Ugh. We squeeze in runs when we can, but it's so hard to breathe. We didn't make a lot of plans for today because we were anticipating awful weather. I ran a Memorial Day 5K with my friend, and then the family and I went out for burgers and shakes. We usually grill and eat with my parents, but they didn't want to be driving in storms, so we will do something later this week. We're definitely feeling tropical here in the Midwest. It's crazy to have this kind of heat and humidity. You'd feel right at home! Very hot and humid here in Michigan, too. I made sure to get my runs in early. I also have a son graduating this year (ceremony is in a couple of weeks), it's definitely bittersweet! Oh gosh! Good luck to your son. What are his plans after college? He's actually heading to college, University of Michigan/Ann Arbor! I have the same problem in the yard - the only thing that seems to grow well are the weeds! Of course, I'm now crazy hesitant to work in the yard after encountering poison ivy/sumac/something! I do have to say that you were in my thoughts this week and a bit of inspiration with my issues - I realized I wasn't being careful, I was being lazy. You always find a way to keep going! I'm glad that you could find inspiration in my journey--that's what this blogging community is all about. We keep each other going! SO we had mid 80s Saturday and mid 50s Sunday and today. Guess what tomorrow will be? 90. I'm not surprised since wild fluctuating temps is the new norm year round. Sigh. I hope you are recovering from your busy weekend. Right? We can have all the seasons in one week now! This weather is hot and sticking around...I am not sure what to expect in Chicago in July when I am there - probably just a baking oven :) We didn't have any plans for Memorial Day, but we met up with family for lunch, the swimming pool in the afternoon, and made cookies this evening. A busy day afterall! Hey Wendy, I'm so sorry that I didn't realize you have been struggling again. I can imagine that the fall really didn't help the RA at all. And steamy or not, you are still out there and that says a lot! And Prom and Graduation pretty much at the same time seems crazy to me! Not only crazy busy for the kids but also for your emotions. Our "memorial day" type of holiday (Liberation Day) was at the beginning of the month. So it was a normal weekend for me. It's gotten WAY warm (and steamy) here. Not my favorite weather. Doing my best not to complain out loud about it since the weather can ALSO change pretty quickly here! a lot of people in the US do their long run on Saturday - for me it's logical to do it on Sunday, but I think that's not the norm. I have to say though, I'd rather run than pull weeds hahahaha! It is good to get your hands in the dirt every now and again even when it's weeding. I do my long runs on Sunday too, so I think we're the normal ones! Yep, I've been struggling pretty much since I ran that fast 10 miler in April. The crash didn't help. I'm still hurting today. I just keep on moving. The alternative is not an option. Good to hear that you are doing better. Great picture of your son and his date, cute couple. I honestly can't wait for prom and graduation to be done! I too had a Home Depot trip for flowers and soil. I find it so hard not to buy one of everything! I won't tell you how much I spent, but I am really enjoying my plants! The weather is the same here, wait 5 minutes if you don't like it and it will change! Your son and his girl friend look beautiful! Thank you! I'm glad they had nice weather for the prom! Does the warm weather help or hinder your RA? Very cute prom pic! That's a great question! Last summer I wasn't too bothered by the heat. This week I've really been feeling it. I think it's the humidity. Your son and his date make quite the good looking couple! Prom and graduation both on the same weekend sounds like a lot going on. 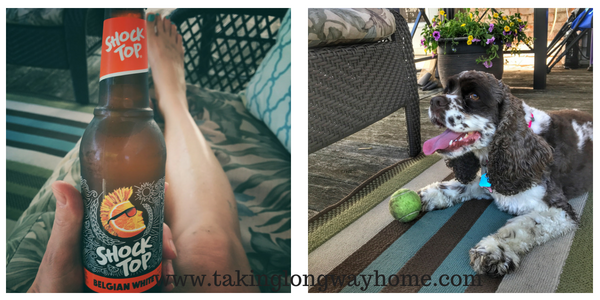 We throw a huge barbecue on the Sunday of Memorial Day weekend every year, and that forces us to get our outdoor projects done early - power washing deck, planting flowers, getting the mulch spread, etc. The weather held out and even though it was very humid, it didn't rain!!! Your BBQ sounds epic! I'd be a wreck hosting that many people. I'm not good at parties! Glad to hear the recovery is going well. Graduation and prom seem like a lot for one weekend... and you did gardening too! I was up in Kansas last week and boy was it warm... seemed warmer than Houston, but maybe because I was expecting 70s-low 80s. I'm pretty sure our weather this weekend would have made you feel right at home.